Sometime back I sold my Vixen SP having foolishly, as I thought, been persuaded to separate it from the installed Celestron Advanced Astromaster (CAA) Digital Setting Circle (DSC). For quite some time the parts of the CAA languished in a box. I offered them for sale, without success. Then, while reading a magazine review of the month’s latest electronic techno-wonder scope (never mind the optics, look at the processing power) it occurred to me that I could use the CAA on my Zeiss Telementor. The "T equatorial" mount is a german equatorial and thus in essence very similar to the Vixen SP. I reasoned that provided the two CAA gears could be securely attached to the RA and DEC shafts of the mount it should work. And of course lack of motor-driven RA was not a problem - the encoders "read" the movement of the shafts : if there’s no actual movement then the computer shows an RA reading changing at the sidereal rate. 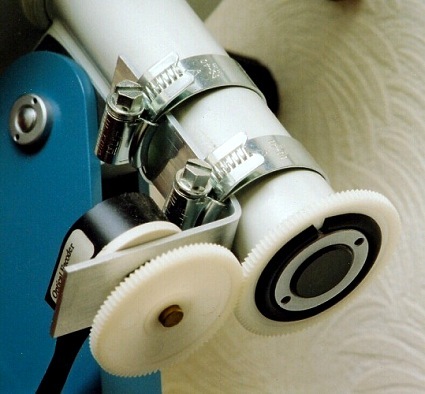 The idea of a traditionally crafted quality telescope retrofitted with a DSC seemed much more appealing than integrated computer scope, particularly at the high price at which these are offered in the UK. Experience of course counselled against the whole idea. McCaughan’s recension of Murphy’s law states "No two items of astronomical equipment will ever fit together, even if designed to." (This is not true of equipment from Astro-Physics Inc. but then, as everyone knows, toast always lands butter-side up in Illinois). Somewhat to my surprise it was not only possible to marry the two: it was easy. 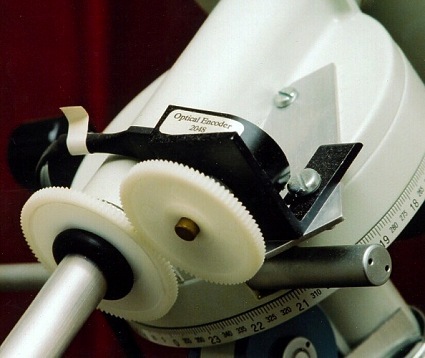 The Celestron Advanced Astromaster was originally developed to fit Celestron’s line of fork-mounted Schmidt Cassegrain Telescopes of the C-8 and Ultima-8 vintage (late 1980s, early 1990s). It was also supplied with hardware suitable for attaching it to the Super Polaris mount generally sold in the US under the Celestron brand. The CAA predates the wide availability of computerised scopes. It consists of a small hand-held battery-powered computer with a one-line LED display, a pair of optical encoders and pairs of nylon gears. In each case one gear is mounted on the shaft of the mount; the other on the shaft of the optical encoder. The encoders are mounted so that the pairs of gears mesh, and accordingly any movement in the mount shaft causes rotation of the encoder shaft. Overall the CAA is quite similar to an early JMI NGC-Max, and to an item offered some years back by Lumicon. 365 stars, more than half of which doubles. 1. Catalog - which gives information on stored objects, referenced by Messier No, RNGC No. etc. 2. Guide - having set up the system, an object can be selected and the display will then guide the telescope to that object. Note that since the "T Equatorial" has no motors the result is a Push-To telescope rather than a full Go-To job. The encoders are relatively low-resolution (2048 steps/revolution) but in practice the system returns entirely satisfactory accuracy : objects are seldom far from the centre of field in a 15mm Plossl. 1. Align the RA axis of the mount on Polaris. There is no need to be overly precise about this. Eyeballing is all that is required. 2. Put the tube in the Dec=0 degrees position. 4. Sight one bright (database) star in the eastern part of the sky and one in the western. 5. select an object e.g. M82 and put computer in "Guide" mode. 6. turn tube until both RA and Dec on read-out are at 0-0. You should then be pointed at M82. The RA slow-mo can be used to keep M82 in view. The good news is that no surgery on the telescope was necessary. The most radical step was to remove one bolt from the four on the front of the RA assembly and replace it with a longer one. The only real work is to produce some suitable mounting hardware. A single right-angled strip of 2mm aluminium is strapped to the rear of the RA housing by two "jubilee" clips. The encoder and gear is mounted through the strip’s bent end and engages with the gear wrapped round the moving part at the very rear of the RA housing. The Dec. encoder sits on an angled piece of aluminium bolted to the front of the RA housing. 2. the gears must mesh snugly. Any "play" will result in spurious readings on the display. 3. the encoders must be positioned so that neither nor the connecting cable are fouled when the telescope tube is moved. If you are interested in pursuing this sort of project I suggest you look for a second-hand DSC set. So long as it was supplied for a German Equatorial Mount, and includes its encoders and gears it ought to be possible to adapt it to the Zeiss mount fairly easily. I have seen a couple advertised - presumably by people upgrading the SP mount to SkySensor "GoTo" spec. JMI have also made a number of models over the last decade - all the way from a basic RA-Dec digital readout to some very powerful computers with big databases and intelligent features. Obviously no-one should make a significant investment without first satisfying themselves that their intended DSC will be compatible. And make sure that you check the specific set you intend to install : Celestron and JMI have changed the design and spec of their models several times over the last decade. Needless to say I should be pleased to offer any help I can to anyone undertaking a similar project.